In May of 2018, global marketing and technology agency Digitas held its annual NewFront at Highline Studios in New York City, and UVLD was there to provide dynamic lighting for the event. Echoing the current political and social climate, cause-based messaging was the theme of the program, and the design approach drove this concept with an environment of dissent and protest. Scenic Designer Chris Goldsmith expertly brought the room to life with a design that played seamlessly with the industrial space of High Line studios, filling the room with low hanging industrial chandeliers and content-fed video monitors held in the grip of protesting fists. UVLD Lighting designer Jeff Nellis drove the concept home with bold colors and angles that highlighted the industrial space and reinforced the dynamic and eye-popping graphic look. 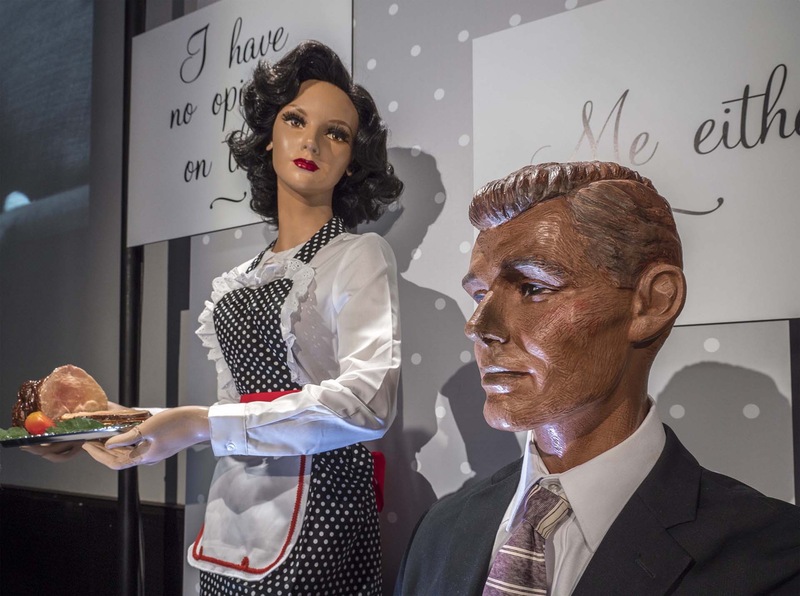 The lobby lounge area was transformed into an industrial chic environment complete with 50s mannequins holding signs echoing the event’s themes. Prior to the event the room was lit and accented with mono-chrome elements and deliberately non-offensive and safe messaging. After the event, the lounge was transformed with bold colorful patterns and colorful lighting. The messaging had been replaced with signs proclaiming Brand Activism Now! UVLD Lighting Designer Greg Cohen jumped in to execute the lighting in this area. The overall event was assembled by Executive Producer David Fink in conjunction with a terrific team from Digitas. Technical Direction was provided by Thomas Herron. The lighting design team was supported by lead electrician Dan Kirsch along with assistant electricians Phil Alfieri and Erik Putz. Lighting equipment was provided by Worldstage with the assistance of Terry Jackson and Susanna Harris-Rea.